If you look to the south from S.H. 56 between Choctaw Creek and Bells you may see the spire of a white church in the distance. The tall belfry and steeple hints at the carpenter’s gothic style of architecture that was popular in the 19th century. 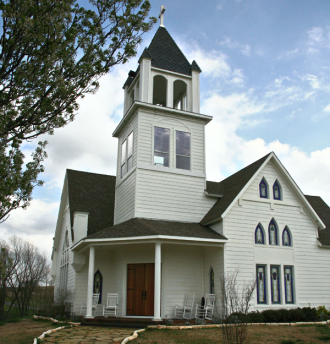 But the church is new, built in 2003 as one of the set pieces of the 350 acre Willowood Ranch, a project of Al Denson, whose best selling CDs and hit singles have made him a headliner in contemporary Christian music circles. Denson bought the rolling pastureland, dotted with ponds and streams, in 2001 as part of a long term plan to develop both a personal retreat and a place to expand his own ministry. Denson’s plans included an 800-seat theater and a banquet and meeting space for up to 1,000. The reception hall opened earlier this year and adds a dimension to the white chapel which has become a popular place for weddings. There is also a ranch house where Denson stays when he comes to Grayson County, and the first of six cottages, two bedroom, two bath residences built to provide accommodations for religious retreats and seminars. Over Memorial Day 2003, the ranch played host to more than 30,000 Christian college-age students, for a three-day event directed toward music, worship and introspection, called One Day 03. The visitors spread out over the hills of the ranch in a sea of tents and congregated at different locations for programs and music. On the second weekend of June this year, North Texas will collide with Denson’s latest concert concept. It’s billed as Collide ’07, and promoters are expecting numbers similar to the ‘03 event to descend on the ranch. This time around the focus will be on families, and 10,000 or more will camp out for three days to join in a ministry of education, prayer and music. More than 40 top-ranked Christian music bands and artists are on the schedule, although Denson himself will not perform. He’ll be there of course, but only in a behind the scenes role. He said that he didn’t want it to appear that he was promoting the festival for his own benefit. The festival is a huge undertaking, and more than 1,000 volunteers will join the regular staff employees to coordinate activities and manage the event. Come June 7 through 9, the hills above Choctaw Creek may just be home to the largest town in Grayson County, and then as quickly as it appeared, it will be gone. But Willowood ranch will still be there, and if Al Denson’s dream comes true, there will be more festivals and scores of other events as the Christian community discovers the little white church in the hills near Bells. For More Information visit collidefestival.com.